Hear ye hear ye! Gather round! The Warlocks Journal has appeared in Tiny Gorks workshop, just lying there all of a sudden on a shelf. Its pages had opened up on an interresting entry, a picture. here is what we know about the Journal. The Warlockâ€™s Journal is an interdimensional book that teleports from place to place, recording knowledge in whatever location it finds itself. The places it goes may be widely separated in time and space and even be in different dimensions or alternate realities. The handful of people who have actually seen the book more than once suggest that it sends its information back to some central location, as they have seen the book nearly filled with information, only to find it almost empty again, or filled with completely different information, at some later point. Of course, since there is no real proof that the book itself travels through time in a linear manner, such analysis is speculation at best. What powerful entity could have created such a marvel? Where is the ultimate repository (if any) of the wealth of knowledge collected by the Journal in its roving, and is its creator still waiting there, learning about the multiverse? It is, perhaps, better not to know. We have now had a contest in creating items of power at the Warlocks Sanctum and the creation of a faction/organisation at Tales of a GM. This time the pages of the journal has opened on a paiting, it looks like a woman trapped in ice. But who is this woman? Why is she trapped in the ice? How did she become trapped in the ice? Will she be set free or break free? 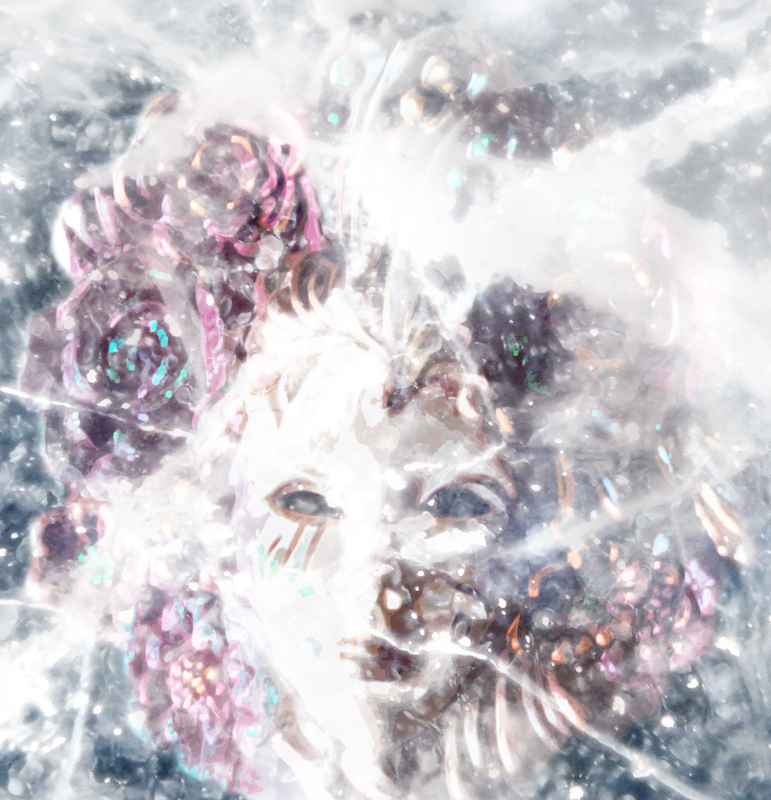 Dig into your imagination, use this image to create the woman in ice. Is she a goddess? An npc? A villain? A heroine? Because i hoping for hundreds of entries to the contest i will have to set a word limit. Bear in mind this is not a word requirement, it is merely a word limit. You are free to use less words, just not more than 300 words. Prize: Tiny Gork is offering the winner the chance to get one of his/her own playercharacters featured. You and I will work together on inserting your very own character into a future product. The last day for submitting entries will be Friday 20th December. The entry is to be system neutral. No stats are required, but you may add system-specific details as a bonus Appendix to your entry, if you wish. Such stats will NOT form part of the Voting pdf, but would appear in the final Contest pdf. All entries must be submitted to gork@tinygork.com subject: Warlocks Journal. Each entrant is limited to TEN submission. Entrants must submit name and email adress. Once the contest is closed, all entries, minus names and any stats, will be placed in a Voting pdf for free download. The second, Contest pdf, will retain names and stats for those entries which included them. Further notes, and details, may also be added to the Contest pdf. While both pdfs will be free, it may be necessary to submit an email address to receive the full Contest pdf. Submission due date is the 20th of December and voting concludes on the 29th of December. Winner will be announced on 31st of December. Voting will be done via surveymonkey. Important Note: Entries remain the property of their Creator, but entry into the Contest grants Michael Christensen and Tiny Gork a licence in perpetuity to use the entry. This licence will allow the publication of the entry in one or more free pdfs, where work will be attributed. Entries may subsequently be expanded upon or otherwise developed for future contests. Thus, for example, the winning entry from this contest may be used as the basis of one or more future contests. “During an era of war, life was lost in immeasurable number. Blood was the ink of life, that by which you defined yourself. Weaponry was for the weak, intimate killing revered. Taking life was an artform defined by the intensity of your passion. The more complete your disregard for humanity, the greater your legacy! Women were oppressed and belittled, their worth weighed by utility and number of males borne. The uses men found for them were beyond the bounds of brutality and depravity. Ruined husks and drones, to be dead inside was considered a blessing. Throughout males outnumbered women 7 to 1. There was no strength, no hope fit for such a creature during this time. To be a pathetic dog worthy of table scraps was enough. A tortured life of servitude was better than dead. The Time of Educible Glory is what they call it. Humanity made vast strides from the muck and filth it slithered from millenium past. A time full of icons and their eminence, with one notable exception. A Barbarian King, master of death, had raised a daughter in the ways of bloodshed. Upon his ending she took his throne from his five hulking generals in provoked combat. One versus five, she floated on the wind, quicker and more agile than any man could ever be. Howling like an animal and bucking with lust, she ripped the throats from each using only her nails and file sharpened teeth. Wish you’d have made the close date! I’ll write it into the final pdf anyways, as its a great story people might find use for. Done – Just sending my entry to the email adressto do. Really liked this one. Must try to enter more of these,loving them! I had some good stuff to Work with. I can really recommend giving Dusterheit’s gallery a look if you want some good gritty textures. Entry submitted today. I hope that you have plenty of entries, I look forward to reading what people have created.